Lamar Morgan + Biz News Buddy + Big 5 = Winning Combination! Biz News Buddy + Social Media Big 5. 02 - Simply email to your list of newsletter subscribers or customers. 03 - Comment on the Article, leading people to your website (again). 04 - Initiate conversation about it at Networks, Groups and Forums. 05 - Submit it to StumbleUpon - More views from bloggers. 06 - Share it on Google+ - #1 Social Media Powerhouse for SEO social signals. 07 - Share it on Facebook - #2 social media outlet for SEO benefits. 08 - Tweet it on Twitter - #3 on the social signals SEO benefits. 09 - Blast it out on Linkedin - to millions of people; multiple times. 10 - Pin it on Pinterest - Social Signals here do help with SEO. All of the above 10 points add to the success of your press release copy. 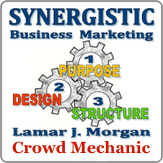 Try them all as part of an ad campaign designed by Lamar Morgan, just for your business. Press Release by Lamar Morgan. Published at a very classy news outlet - Biz News Buddy. Shared by co-workers, friends and family to social media. CONNECT with Lamar and get started on your Press Release Project! Ask Lamar for a quote by email or phone - no hourly fees! Project quotes only. View Press Release Packages at Biz News Buddy. How to write a press release is no secret and any writer can accomplish this task. Basic instructions provided here, just in case you may need a refresher. But distribution is another matter altogether. Where do you send the press release? Who do you talk to, if anyone? When will the press release be published? Will someone edit my press release? If it's too short, how do I expand the copy? No need to agonize or even ask if you utilize an outside service. It is all taken care of for you. Professional press release copy sends people to YOU, instead of you needing to round up clients/customers.